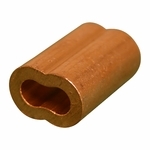 These copper swage sleeves install easily using our wire rope swagers, and they're a cost-effective yet strong termination for wire rope assemblies. Properly installed swage sleeves will ultimately yield higher breaking strengths than Wire Rope Clips. You can expect to retain about 90% of your wire rope's published Breaking Strength when installing these sleeves correctly using one of our Hand Swagers. Copper is also a more popular choice than aluminum for those working near water (aluminum, stainless and water do not mix).